The revised port of the arcade classic may be missing a few of the original licensed music and KFC restaurants, but it’ll be making up for it with a number of additions when it arrives on the 24th of November. Widescreen support will be added, as well as the obligatory high-resolution, leaderboards and achievements. That aside, everything else will be the same as the original. I don’t hate Crazy Taxi, and at the $10 bracket I’ll probably end up getting this anyway just for the throwaway arcade fun factor. However, I can’t help but wish this was any other game on the system. I still don’t get why out of all the possible choices they went with Crazy Taxi, but hopefully that means we’ll get to hear more of the next re-print soon enough. Especially if it’s an RPG starring Cam Clarke. The Dreamcast Marathon Midnight Update! Yeah, I really like Crazy Taxi and all, but there are already a lot of Sega racing/ arcade driving games on the 360. We have Rally, Sonic and Sega All Stars, Outrun Live Arcade, soon Sonic Riders, etc. This doesn’t fill a niche the way some of their other stuff might. WOW! Sonic had nothing new and Crazy Taxi has widescreen. 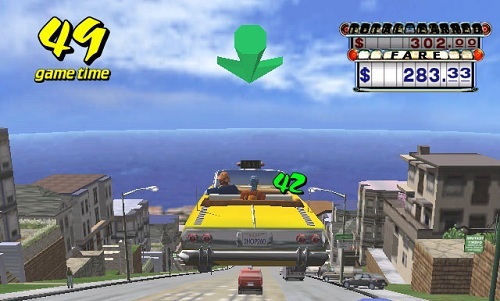 Crazy Taxi isn’t a simple racer, though, even today it’s got a pretty unique slant that makes it different than all the other driving games out there. That and it was one of the best selling games on the Dreamcast. It practically defined the system after the launch luster of Sonic Adventure and Soul Calibur wore off. Very cool that they’re giving it a widescreen option and some HD polish. Why they wouldn’t do that for Sonic, though, is curious. One of the most annoying things about the Sonic Adventure port was the blue frame around the screen because they didn’t add the widescreen support. It’s very nice that Crazy Taxi is getting that addition. If Shenmue ever comes out for this service it will be amazing to see it done in widescreen.